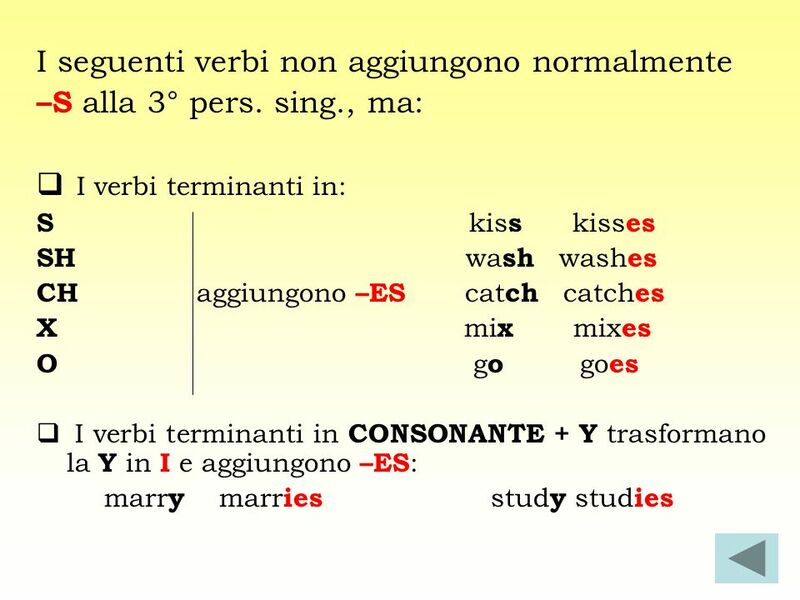 2 Use Si usa per parlare di azioni abituali, situazioni permanenti e dati di fatto. Ex. I work every Saturday. 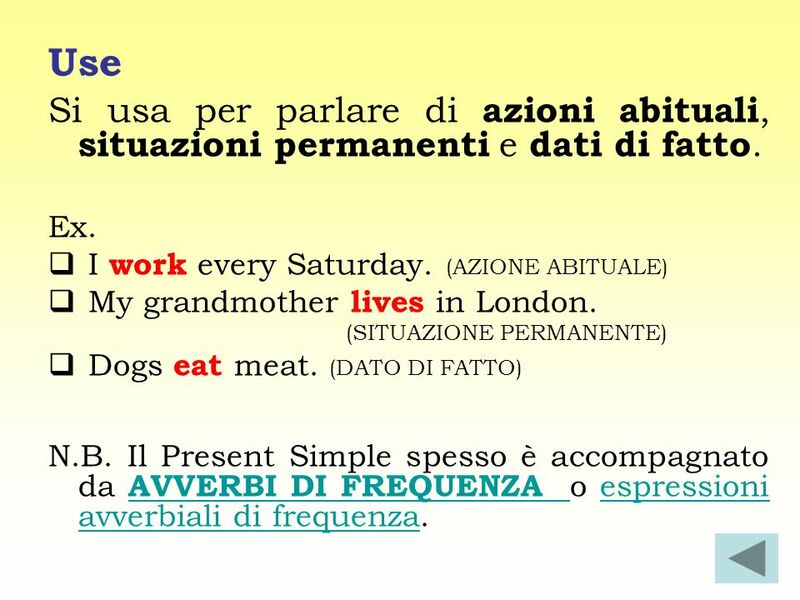 (AZIONE ABITUALE) My grandmother lives in London. (SITUAZIONE PERMANENTE) Dogs eat meat. (DATO DI FATTO) N.B. 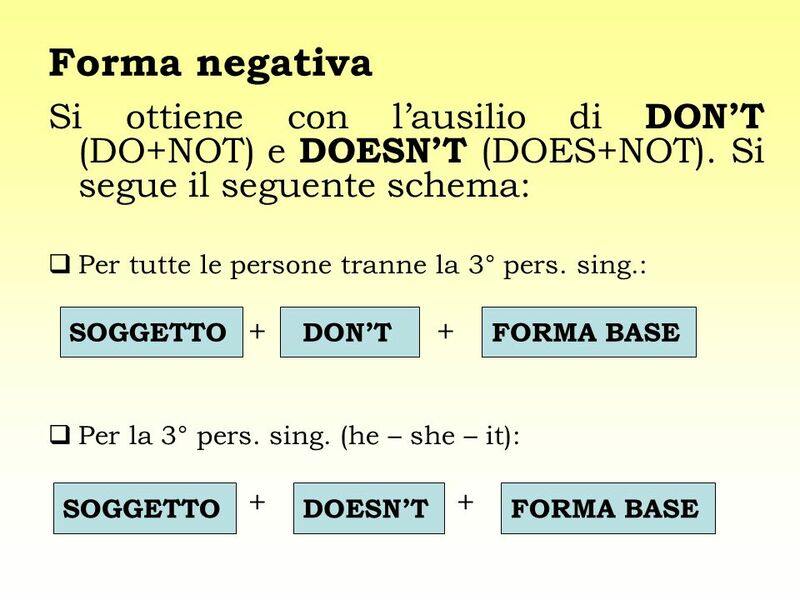 Il Present Simple spesso è accompagnato da AVVERBI DI FREQUENZA o espressioni avverbiali di frequenza. 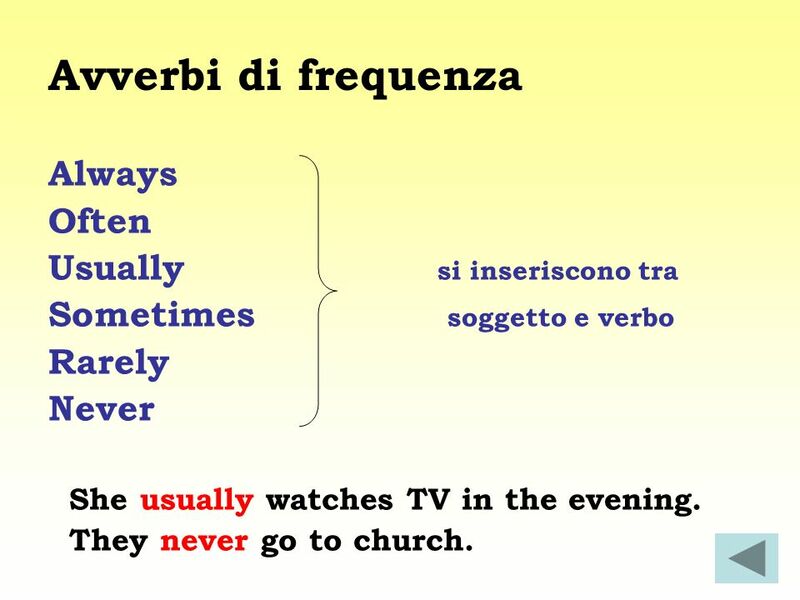 Sometimes soggetto e verbo Rarely Never She usually watches TV in the evening. They never go to church. 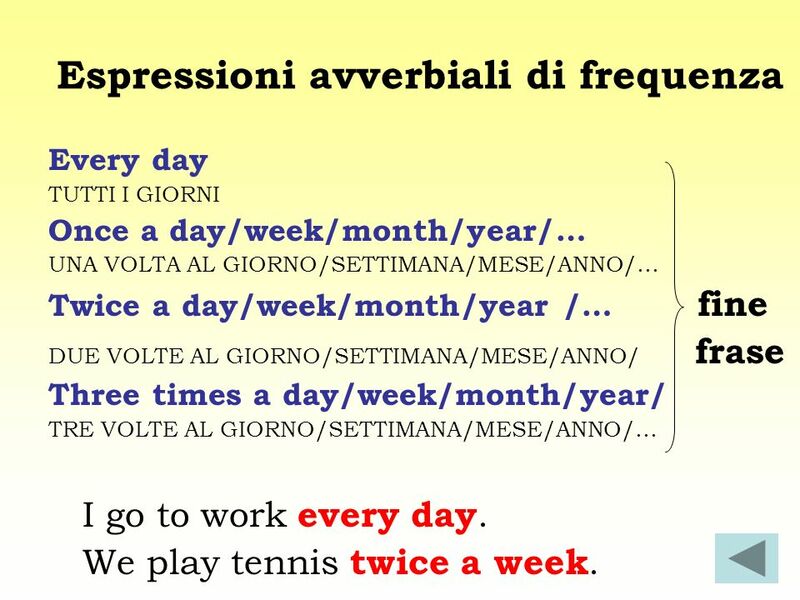 Every day TUTTI I GIORNI Once a day/week/month/year/… UNA VOLTA AL GIORNO/SETTIMANA/MESE/ANNO/… Twice a day/week/month/year /… fine DUE VOLTE AL GIORNO/SETTIMANA/MESE/ANNO/ frase Three times a day/week/month/year/ TRE VOLTE AL GIORNO/SETTIMANA/MESE/ANNO/… I go to work every day. We play tennis twice a week. 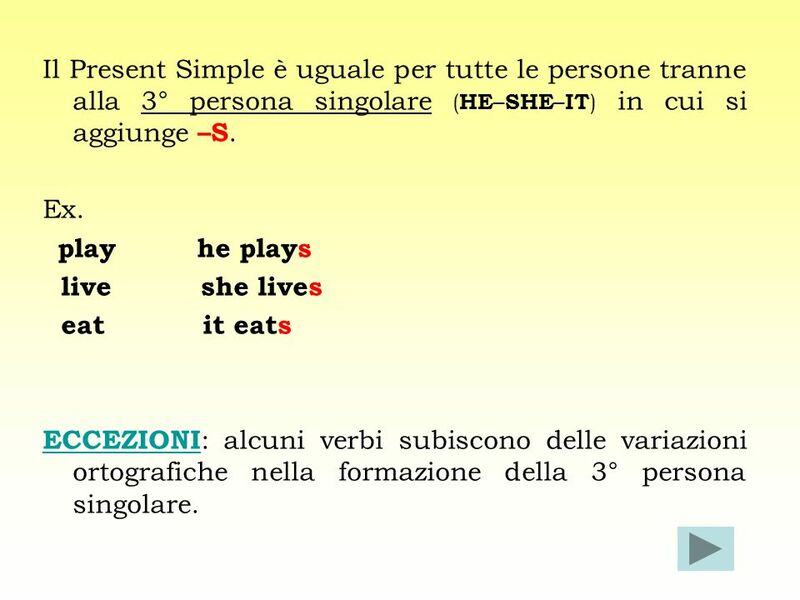 6 Il Present Simple è uguale per tutte le persone tranne alla 3° persona singolare (HE–SHE–IT) in cui si aggiunge –S. Ex. 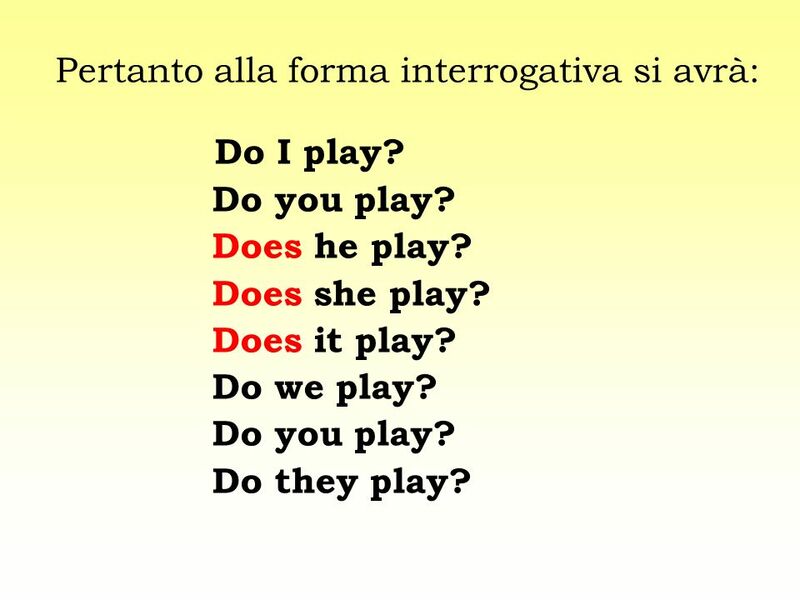 play he plays live she lives eat it eats ECCEZIONI: alcuni verbi subiscono delle variazioni ortografiche nella formazione della 3° persona singolare. 10 Ex. Do they watch TV? LORO GUARDANO LA TV? Does he study English? 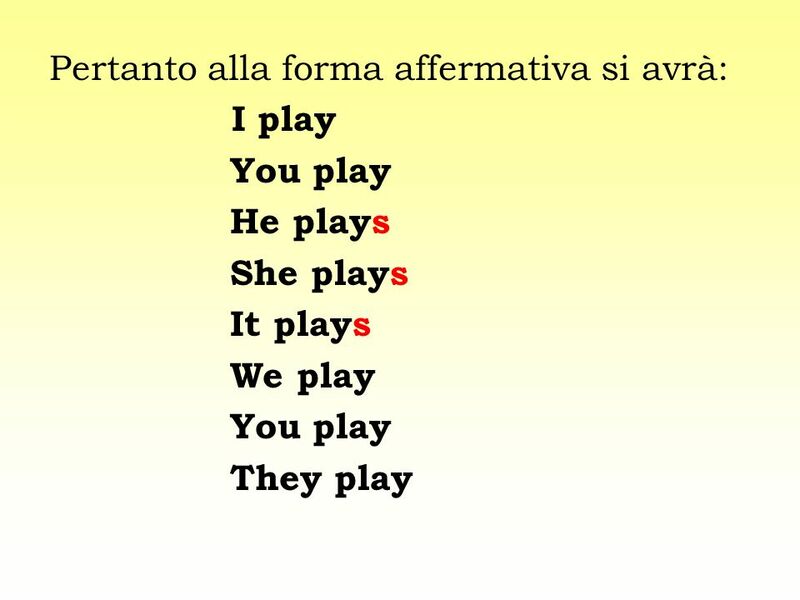 LUI STUDIA L’INGLESE? N.B. 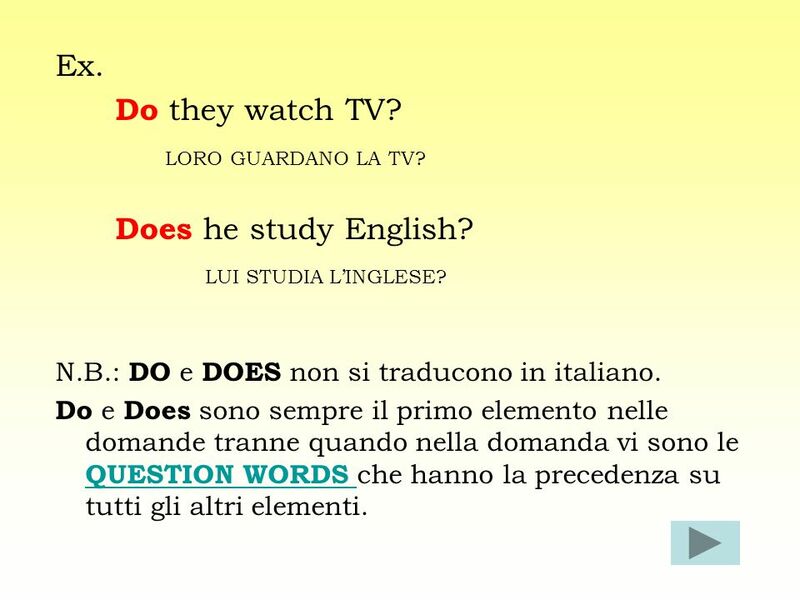 : DO e DOES non si traducono in italiano. 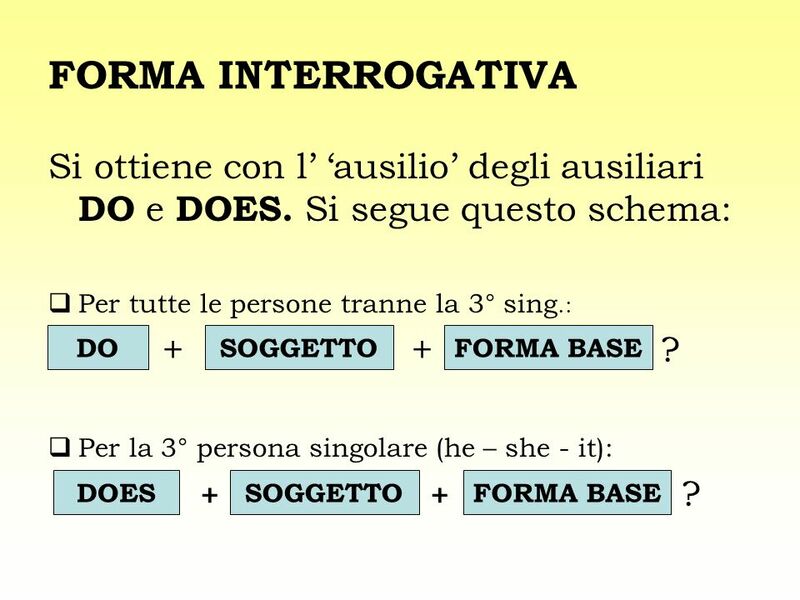 Do e Does sono sempre il primo elemento nelle domande tranne quando nella domanda vi sono le QUESTION WORDS che hanno la precedenza su tutti gli altri elementi. 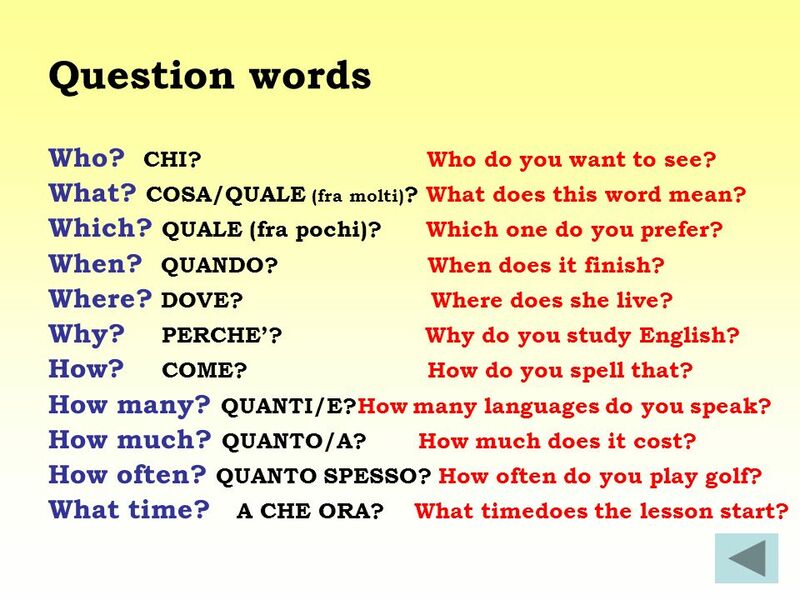 11 Question words Who? CHI? Who do you want to see? What? COSA/QUALE (fra molti)? What does this word mean? Which? QUALE (fra pochi)? Which one do you prefer? When? QUANDO? When does it finish? Where? DOVE? Where does she live? Why? PERCHE’? Why do you study English? How? COME? How do you spell that? How many? QUANTI/E?How many languages do you speak? How much? QUANTO/A? How much does it cost? How often? QUANTO SPESSO? How often do you play golf? What time? A CHE ORA? What timedoes the lesson start? Do I play? Do you play? Does he play? Does she play? Does it play? Do we play? Do they play? 14 Ex. They don’t read newspapers. LORO NON LEGGONO QUOTIDIANI. She doesn’t teach* Maths. 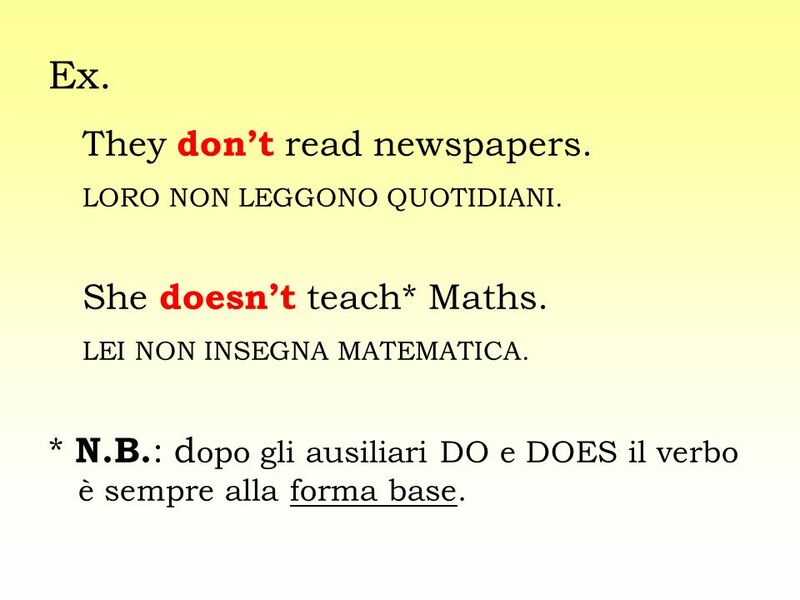 LEI NON INSEGNA MATEMATICA. * N.B. : dopo gli ausiliari DO e DOES il verbo è sempre alla forma base. 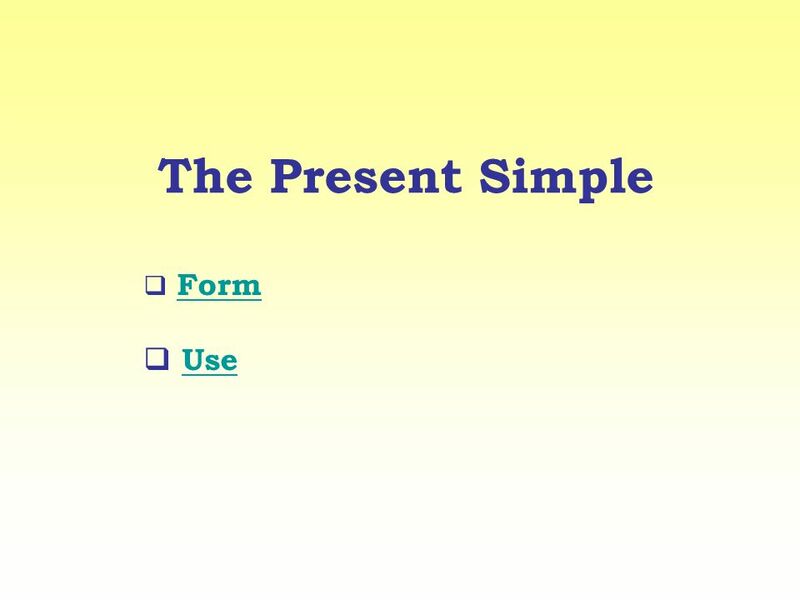 Scaricare ppt "The Present Simple Form Use." 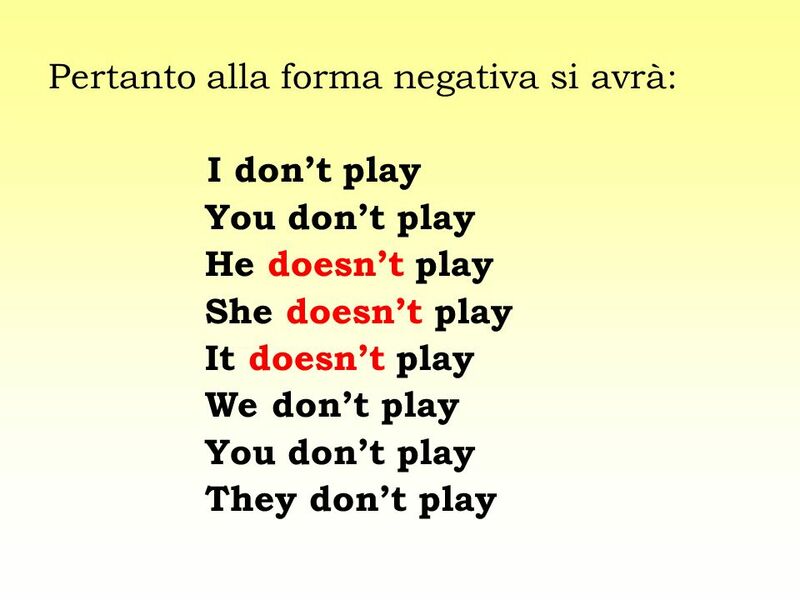 I verbi riflessivi in italiano…. 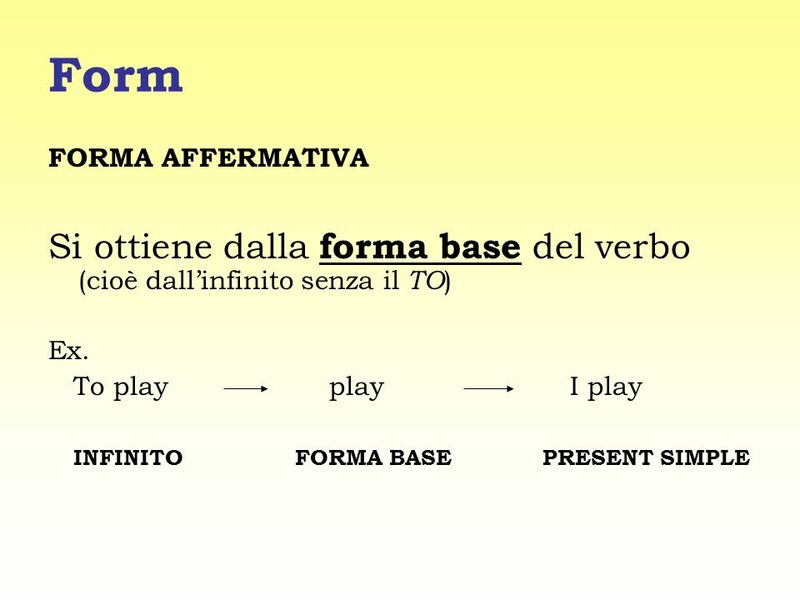 Simple Past A cura di Mara Cruciani.